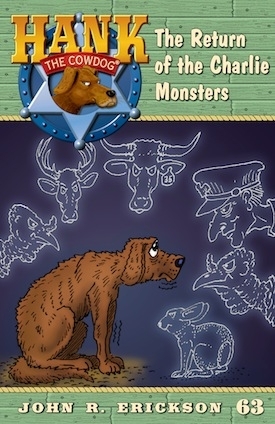 Here's a peek at the next Hank book, "The Return of the Charlie Monsters," and - true to form - it's a GREAT one! The official release date is April 8, 2014. In the meantime, keep an eye out for fun contests and updates! In this exciting case, Hank falls victim to a series of sneaky schemes: first, a Turkey Debacle endangers his relationship with Sally May, then, a case of poisoning puts him at death’s doornail, and finally, a disastrous ride to town almost finishes him off. As each terrible event takes its toll on his reputation - not to mention his dignity - Hank begins to notice a pattern. Could it be that an evil mastermind is behind these plots? As the pieces of the puzzle fall into place, Hank narrows down the pool of suspects and finds himself drawn into a deep, dark conspiracy orchestrated by his mortal enemy...or is it mortal enemies?